North of San Francisco, California Highway 1 clings to the state's western edge, winding north from Sausalito through Marin, Sonoma and Mendocino Counties. North of Fort Bragg, it veers inland, ending where it connects with U.S. Highway 101 in the town of Leggett. The two-lane highway follows the coastal contours, rising and falling, zig-zagging around coves and curving around hillsides slopes falling to the sea. Going can be slow, and passing lanes are few. Expect to average 30 to 40 miles per hour. If you drive north, you'll be on the inside of curves, making it the best choice if you or your passengers are nervous about driving above the cliffs. Views are also clearer in that direction. Going south, you don't have to cross traffic to turn off into vista points. You can drive from Sausalito to Leggett in a day, but it would be a tiring one. You will enjoy it more if you stop overnight. If your time is limited, don't miss the Mendocino Coast which is by far the prettiest part of the drive, with the coastal mountains flattening to make room for woods and meadows. Point Reyes is also a must-see. To save time south of there, take Sir Francis Drake Blvd. between US Highway 101 and California Highway 1. Fill your tank with gas and empty your bladder. Gas stations and restrooms are few, and as far as 30 miles apart. If you or anyone in your group suffers from motion sickness, bring your favorite remedies. 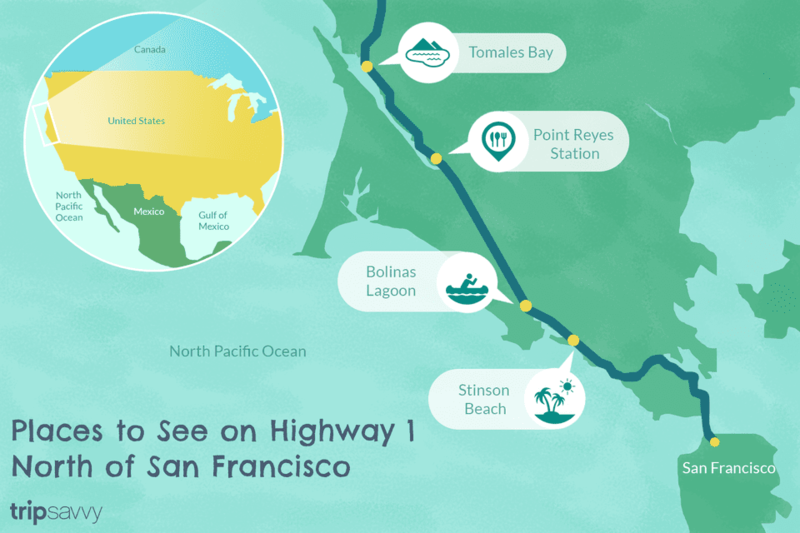 Most of California Highway 1 in Marin is inland, with a short stretch of ocean views near Stinson Beach. Inland doesn't mean it's straight and flat, though. In fact, Highway 1 in southern Marin County is more corkscrew-like than along the Big Sur coast. Expect to average 20 to 25 miles per hour. In order from south to north. Stinson Beach is a nice, 3-mile long beach park. Bolinas Lagoon is a tidal estuary that attracts over 60 species of water and shorebirds. On the west side of the highway, the town of Bolinas is best-known for residents' attempts to keep outsiders from finding them, which include taking down highway signs as soon as they go up. Point Reyes Station has the most shops and places to eat on the Marin coast, and the only gas station. Tomales Bay Foods on 4th Street sells Cowgirl Creamery cheese and other picnic goodies. Tomales Bay, an estuary about a mile wide and 20 miles long, the mirrored twin of Bolinas Lagoon, extends north. Near the shoreline town of Marshall, the Tomales Bay produces some of California's best oysters. If you have plenty of time, you can reach the Marin Headlands, by exiting U.S. Highway 101 at Alexander Avenue. Turn west onto Conzelman Road for dramatic Golden Gate Bridge and city views, Point Bonita Lighthouse and Rodeo Beach. For a side trip into Sausalito, exit U.S. Highway 101 at Alexander Avenue and go downhill. You'll end up on Bridgeway Blvd., lined with shops and places to eat. On the north side of town, turn east on Gate 5 Road to see the town's largest houseboat marina, an eclectic collection of floating homes. Muir Woods is about 10 miles off CA Highway 1 via a well-marked road but getting in to see it is more complicated than you might think. Point Reyes National Seashore has a scenic lighthouse, several excellent beaches and much to see. It's lovely but covers a lot of territory and the most interesting portions far off the highway. It takes at least 3 hours to see even a small part of it. Dillon Beach is a privately-owned family beach at the north end of Tomales Bay, a nice place to stretch your legs. Turn west onto Dillon Beach Road in the town of Tomales. Get gasoline in Sausalito or Mill Valley going north or in Point Reyes Station going south. For almost 30 miles in between, there are no gas stations. Humans can fuel up in several places, including Stinson Beach, Olema, and Point Reyes Station. In Sonoma County, CA Highway 1 sticks to the coastline. It's less curvy and hilly than in other areas, with only a few miles north of Jenner rivaling southern counterparts for a white-knuckle ride. During summer, be prepared for damp, windy weather. In winter, you may encounter storms. Spring and fall bring the clearest days. Cellphone signals range from weak to nonexistent along most of the Sonoma coast, except in the towns. Bodega Bay was the shooting location Alfred Hitchcock's film The Birds. It also has plenty of restaurants and places to stay. North of Bodega Bay, sea stacks appear along the coast, monoliths formed when a rock resists erosion more than those surrounding it. They make dramatic scenery, the ocean breaking into white foam against them. Sonoma Coast State Beaches encompasses several small beaches between Bodega Bay and Jenner. Many are little more than a gravel-paved parking area with stairs to the waterside - any makes a fine stop if it catches your eye. The Russian River empties into the sea south of Jenner, running beside Goat Rock through one of the Sonoma Coast's most photogenic beaches. Turn off the highway just south of the river. Fort Ross was built in 1812 as a Russian seal- and otter-hunting base. It's a worthwhile stop if you like history. Planned community Sea Ranch stretches along the highway for many miles. Designed to have a minimal visual impact, its strict building and landscaping codes spawn a unique architectural style. Sea Ranch has a hotel and restaurant. Gualala Pronounced wa-LA-la, it's technically in Mendocino County, but it's the nearest town to the county line. Gualala has hotels, restaurants, shops, gas stations, an auto mechanic and just about anything else. Surf Market (39250 South Highway One) is an especially good place to pick up picnic supplies. You'll find gasoline stations and food in Bodega Bay, Jenner and Gualala, and restaurants at Timber Cove Resort and Sea Ranch Lodge. In Mendocino County, the mountains pull back from the ocean and contours are more rounded, making for the most beautiful views along CA Highway 1 north of San Francisco. In late spring and early summer, wildflowers abound. Like the rest of its length, Highway 1 is a twisting, winding road in Mendocino, but lacking the white-knuckle-inducing, sheer drop-offs found further south. Gualala Pronounced wa-LA-la, it's the biggest town between San Francisco and Fort Bragg. Gualala has lots of hotels, restaurants, shops, gas stations, an auto mechanic and just about anything else you might need. Point Arena Lighthouse was the first steel-reinforced concrete lighthouse in the United States and is one of California's most beautifully sited. Mendocino is the county's most attractive tourist town and the best place to find lodging on your way north. The backdrop for several films including The Majestic, The Russians Are Coming the Russians Are Coming and television program Murder, She Wrote, it looks more like a cute little New England town than most places in California and is good for an hour's wander or an overnight stop. Coast Botanical Garden is situated between the Pacific coast and Highway One and home to rare plants that you may not find elsewhere. A short visit makes for a nice leg-stretch, but don't blame us if you stay longer than you intended. Point Cabrillo Lighthouse boasts a third order, British-built Fresnel lens that can be seen for almost 15 miles. You can tour the restored lighthouse, the Lightkeeper's Home and Museum and the grounds. CA Highway 1 turns inland about 25 miles north of Fort Bragg and ends where it intersects U.S. Highway 101 at Leggett. You'll find gas stations, food, and lodging in Gualala, Point Arena, Mendocino and Fort Bragg. Lots of cute little bed and breakfast inns and small hotels cluster along the highway, making for plenty of opportunities for a night's rest. If you need a restroom in an emergency, you'll find a pit toilet near the Greenwood State Park entrance in Elk, across the street from the deli.